This page contains lots of printable Father's Day greeting cards, writing activities, and worksheets. Make Father's Day gifts for Dads, Grandpas, and Uncles. 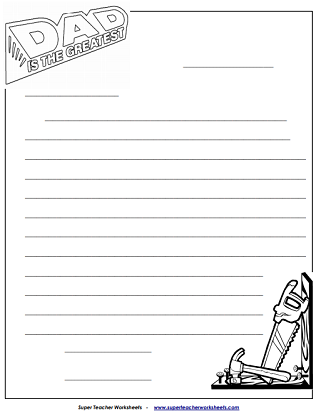 This worksheet was designed with primary ruled paper for younger students. They fill in their father's height, age, hairstyle, favorite foods, and then they tell why he's special. Kids can design this special award for their dad. They color the pictures and write a sentence explaining why their dad is receiving the award. Here's another award certificate that kids can decorate and give to their father. Dad will be proud to receive this "Best Dad" trophy! Print out the trophy on cardstock paper, cut out the shapes with scissors, and glue them together. Kids will have fun putting this craft together and giving it to their father! 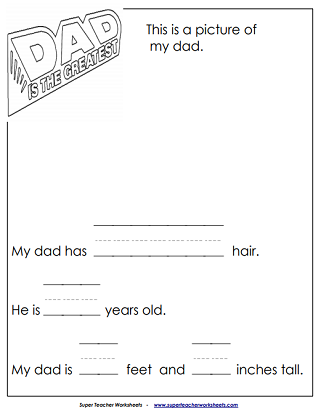 Grandkids can tell why their grandpa is special in this fun writing assignment. They also guess his age, height, hairstyle, and tell what things they like to do when they're with grandpa. Make a very special certificate for the World's Best Grandpa! Kids fill in the reason grandpa is receiving the award and color the pictures. This printable and color-able card reads, "You are the best grandpa ever!" This card features an illustration of a man's shirt with a button that reads, "#1 Grandpa!!" Making this "Best Grandpa" trophy is as easy as 1-2-3! Print out the file on heavy paper such as cardstock. Cut out each piece with scissors. Glue the pieces together. You're done! Grandpa will love his handmade award! Students can write about their favorite uncle and tell why he's a special person. This printable has primary lined paper for younger writers. Kids can make a unique award for the most Awesome Uncle on Earth. Students decorate and write a special message. Then give it as a gift to their favorite uncle. Kids can color this Father's Day card for their favorite uncle. It reads, "You're the Best Uncle Ever!" This printable card has a picture of a shirt and tie, and a button that reads, "#1 Uncle!" Draw pictures and write about your stepdad. Print, color, and write on this award for a super stepdad. This card has a picture of a flower bouquet and it reads, "I love my Stepfather!" This has a picture of flowers in a mug. It says, "World's Best Stepdad" on the cup. This has a picture of an animal with a balloon. It reads, "You're the Greatest Stepdad!" This card has a cute picture of a father bear and his cub spending time together. This card has an adorable picture of a young boy dressed up in a suit just like his dad. This card has a cup of daisies for students to color, and the phrase, "World's Best Dad." Color this card and write a special message inside. Picture shows a man wearing a #1 Dad button. The front of this card features a father's shirt and tie with a button that reads, "#1 Dad." This card says, "You're the Best Daddy Ever!" The picture shows a father holding up his happy daughter. This card reads, "You taught me everything I know, Dad!" The picture shows a kid holding a baseball glove and ball. This greeting card reads, "You're the best, Dad." It has a picture of a father and son hugging. Students can glue their own photos onto the faces. Andy can't wait to give his dad his Father's Day gift, but when he wakes up, he finds his dad has a present for him too. Andy is about to learn the best Father's Day gift is father-son time together. The child in this poem thinks outside the box to find a special Father's Day gift for his dad - and Dad's reaction isn't quite what he expected. The main character in this poem has a Superstar Dad who tells jokes, scares away monsters, and has an appreciation for big bugs. This Father's Day poem is a tribute to loving, supportive dads. 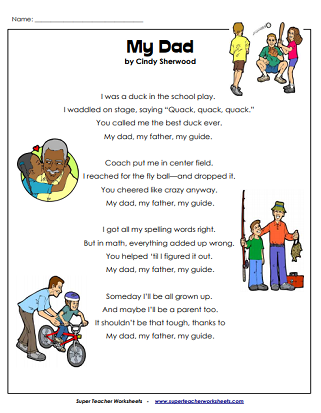 Here's another fun poem about a child who wants to play with his dad. Write a story to tell what's happening in the picture. A girl has made a mug to give to her dad on Father's Day, but she's accidentally broken it. What will she do? For more holiday worksheets, please visit our main holiday directory. Looking to make gifts for Mom? Our Mother's Day page has more cards and activities.